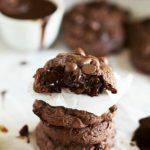 A brownie mix, chocolate pudding, and chocolate hot fudge all come together to make the most epic chocolate cookies yet. Oh and did I mention the chocolate chips? 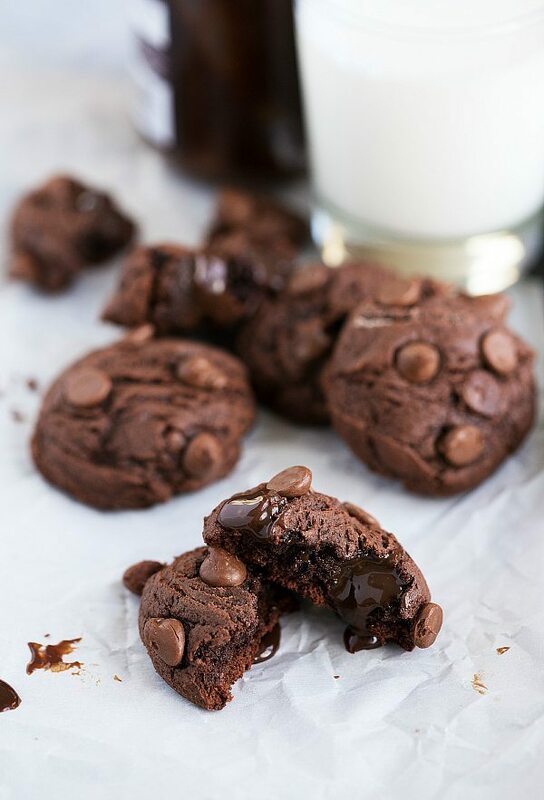 These brownie cookies are soft, chewy, and super fudgy. I know. I know. Cookies on a Monday, and BROWNIE COOKIES at that. What was I thinking? And then of course, loads of chocolate chips. I like to use a mix of chocolate chip chunks and regular chocolate chips. The chunks in the middle get all melty and with each bite, these cookies pretty much taste like a molten lava cake in cookie form. While still tasting like a fudge brownie. Because that all makes sense right? What you need to know is this — these cookies are the best chocolate-lover’s cookie around! So to answer the question I started the post off with… I was thinking, you definitely need this amount of chocolate in your life on a Monday morning. Because coping with the fact that it is no longer the weekend AND daylight savings (getting an extra hour) is not for another whole week. Well, then you understand right? These cookies are a must. Off topic, but I’m already wondering. Will the whole daylight savings even mean anything for me with a baby on a strict “wake up at 5:30” routine. Or will he basically be waking up at the new 5:30 which is technically 4:30? Resulting in the once coveted daylight savings just being a very long day? Ah well. I, mean his cuteness will definitely make up for it, like it does every morning when I see 5:30 on the clock and think…really??! Anyways. Clearly, I’ll be making these cookies next Sunday morning as well. To make up for the fact that my cute baby will most likely not get the idea that I’m supposed to be sleeping in another hour. And the hot fudge – cooled. I used my straight out of the fridge and it was very cold. If you are using room temperature hot fudge, you may have to chill this dough before baking the cookies. Or just chill the fudge first – whatever is easiest. Next up, the thicker and chewier you want these cookies (more cakey), the more flour you’ll want to add. If you want these cookies to spread more (a very defined chewy center with crisp edges), leave out 2 tablespoons of flour. This recipe is pretty forgiving with the flour – basically allowing you to test out your cookies and find the perfect consistency for you. (Obviously this recipe is the perfect consistency for me, but everyone is different!) So how do you find your perfect consistency? Add a little bit of flour, and then cook just 1-2 cookies. If you like the consistency of the cookie, cook the rest. If you want them puffier/chewier, add a couple more tablespoons of flour and try again. Pretty factor (optional) – I like to stick a few extra chocolate chips on the tops of my cookie dough before baking. Totally optional, but oh so pretty. You’ll want to use a cookie scoop and then don’t press down or flatten these cookies at all – they’ll flatten as they bake! No cookie scoop? Try to mimic one – a tall and round ball of dough – not flattened. Make sure to use the right amounts on all the ingredients – for instance, don’t use a medium egg. You’ll need a large one. And, for the brownie mix, make sure you use the same sized (check the ounces) box that I call out for in the recipe. Otherwise, these cookies will likely be off. Another optional tip: I LOVE mixing two different kinds of chocolate chips – chunks and regular chocolate chips (semi-sweet and milk chocolate). Sososososo good! Okay, that wraps up the keys for success on these guys. ENJOY!! Make sure to have a brownie mix with 18.4 ounces and a large egg. Beat together the brownie mix, egg, fudge pudding mix, vanilla, butter, hot fudge topping, and white flour. Using a cookie scoop, scoop the dough onto a parchment lined baking tray. Don't flatten the cookies. If you don't have a cookie scoop make round and "high" (not flattened) balls of dough. Place some chocolate chips on the top if desired. Feel free to play around with the amount of flour in this recipe. Less will make the cookies spread more (more flat and crisp) while more flour will make these cookies more thick, puffy, and cake-like. I used the amount indicated in the recipe for the cookies pictured in this post. **Higher Altitudes will need more flour -- add until the dough pulls away from the sides of the bowl. Three times the chocolate- I can live with that. Cookies on a Monday should be trending. I am ALL about triple chocolate on a Monday. Monday needs it to be okay. And these photos are GORGEOUS girl! Love how easy these cookies are! Pinned! Yummy! These are like my perfect cookie. Chocolate, chocolate and more chocolate! Have a fabulous day Chelsea! These look incredible! I love chocolate on Monday’s, so I can’t wait to make these! Cookies on a Monday are definitely needed, Chelsea! Just the title alone is making me drool! These cookies sound fantastic! Tripe chocolate and hot fudge? Sign me up! Pinned! GAH! Chelsea, that hot fudge sauce is literally making my mouth water! These quadruple chocolate bombs are just that – the BOMB! They look amazing! And, you’re making me very, very hungry from some ultra chocolate! these look great! so chocolately! yum. Seriously that chocolate! Monday’s are made for cookies and chocolate!! Yes please!! These look so divine Chelsea and yet not a lot of ingredients! A definite plus!! Wow these cookies are heavy hitters. l love the fact that they are not dry. Chocolate cookies and brownies themselves can be dry. These babies are NOT. You can never have too much chocolate! Definitely have to try these soon — pinning for sure! Oh gooey cookies are my weakness! These look truly scrumptious! Love how rich and fudgy these look! These would disappear in no time at my house! Wow! I don’t think these could look any yummier! The whole chocolate-brownie-cookie thing is amazing! I think I am in love. These cookies look so insanely delicious! Now I don’t have to choose between brownies and cookies! And it sounds to me like you are going to have a 4:30am wakeup call next week – eeek!! These look amazing! You are totally speaking my language with all that chocolate! Oh gosh! Thank you for this! As far as I’m concerned…any day’s a great day for these cookies!! Holy cow I love how much chocolate is happening in this one glorious, chewy cookie! And your photos are beautiful, Chelsea! Love that chocolate covered spoon in the first photo. 😀 Pinning immediately. ohMILORD! These cookies are insane! So molten and chocolatey and chewy and oooooh heaven need need need em! These cookies are chocolate overload!!! …and I love it! Pinning this chocolate on chocolate on chocolate… on chocolate action! Oh my, these cookies look to die for!! You’ve taken chocolate cookies to a whole new level, i love it! Pinning for sure! how many cookies did this recipe make for you? These look delicious!! How many cookies does it make? And what size cookie scoop did you use? Can these brownie/cookies be frozen? I haven’t ever tried freezing them so I’m not sure how they would do. I imagine they won’t be quite as fudgy if frozen once cooked but I bet the dough would freeze well. Sorry to not be of more help! Amazing! My father who is a chocolate fanatic loved these! I actually like that it doesn’t make a ton of cookies as he’s the only real chocolate lover in the family so a big batch is too much. This made the perfect amount and he loved them. Thanks for sharing this! Is the 9-12 mins of cooking time less cooking time you use or you use less then that?